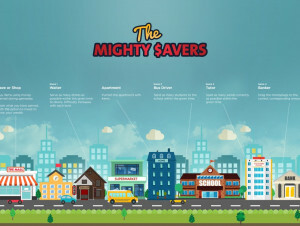 Collaborating with Yu Neng Primary School, OCBC Bank launched a financial literacy app, The Mighty Savers, in 2015 which sets out to benefit all young children. This project also fits neatly into Singapore’s Smart Nation vision. 25% of the students in Yu Neng Primary School require financial assistance. As young children aged 7 to 12 may not understand important money management concepts, the school launched an initiative to teach them to save regularly, spend wisely, differentiate needs from wants, invest carefully and give to others. The solution has to inject fun into these money concepts so that the children can remember them for life. To engage the students from game development stage, we encouraged them to submit concept proposals. The winning entry was picked for its creativity and relevance to money concepts. We then guided the winning team on the storyboarding process to create the gameplay. We also ran a boot camp to teach these students basic coding and design skills. The app is simple and realistic. Players are required to earn money through various jobs to furnish an apartment. The jobs are designed to be progressive so that players perform different tasks in varying degrees of difficulty. After earning the money, players are given the option to invest it. Over time, players see their money grow and understand the concept of compounded interest. During the game, players will often run out of “hearts” and need to buy food from the mall. They will have to decide between an economical bowl of noodles or fast food, which is more expensive. Thus, players learn to spend wisely and be responsible for their money. Through this app, children will learn basic money management concepts of earning, saving, spending and investing. They also learn how to make better decisions when they need to spend so that they can still achieve their ultimate goal of furnishing the apartment. We designed each game to be fun and educational. 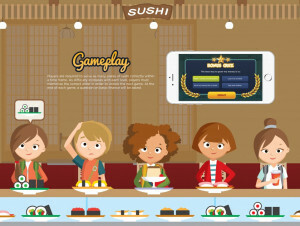 In the first game, Sushi Rush, players are required to serve as many plates of sushi to the correct customer within a time frame. The second game, Traffic Rush, sees the player as a bus driver who picks up students and sends them to school. This requires concentration and quick reflexes to avoid incoming traffic. Spelling Bee is a game where players need to spell out as many words correctly as possible. A character appears randomly to ask for an alphabet and players need to give it up despite them needing it later in the game. This teaches the children the gift of giving. In the last game, Banker, players need to drag moneybags to the corresponding amount and this hones their math skills. At the end of each game, a bonus question will be asked to reinforce some money concepts and let players earn money. The game is anything but trivial; it requires concentration and taking wise decisions. 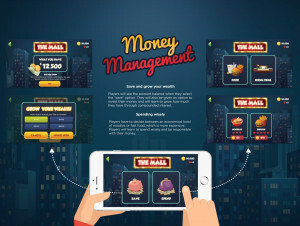 The synergy has created a useful tool that teaches important money management skills to the young.